Over the last year Molly Dilworth has spent time in ports along the Hudson River, studying the history of commerce between the United States and Latin America, particularly the Caribbean. 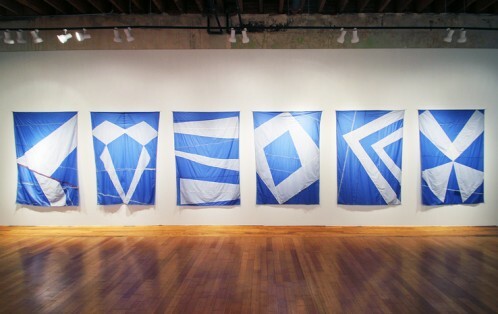 During this time, Dilworth began working with retired sails, and Sans Souci – this exhibition – features eleven large sailcloth flags, which fuse Dilworth’s use of geometric forms pulled from history and contemporary branding practices, with her study of the long history of trade between lower Manhattan and the Caribbean. 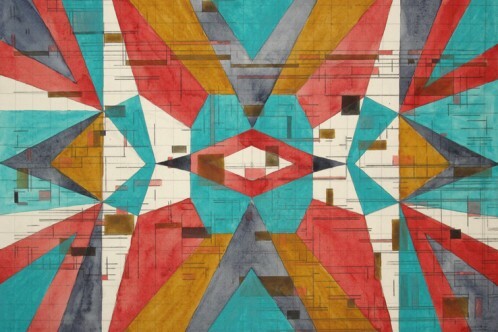 Sans Souci showcases Dilworth’s use of colorful, symbolic patterns and materials and continues the artist’s investigation of the history and contemporary ramifications of global trade, slavery, and the ethics concerning these issues. Titled after the French term for “carefree,” or “no worries,” Sans Souci also references the palace built by King Henri I, in the early nineteenth century in the decade following the Haitian Revolution. Henri I, one of the first leaders of Haiti following the victory over France, built the palace as a monument to the magnificence of the African Caribbean leadership. Thought to named after the palace of Frederick the Great in Potsdam, it itself a symbol of European Enlightenment, the Sans-Souci Palace was a site of great luxury, and simultaneously, a symbol of the autocratic rule of Henri I, whose forced labor policy of corvée closely mirrored the slavery that Haitians, including Henri I, had warred fiercely for over a decade to abolish.